The winds laid down and gave us a window to try and find some black fin tuna. This was my last chance on this trip and I was joined by David from Ft. Lauderdale. It was a little rough but as we approached the Humps (AKA the “parking area”) we saw some birds and put out the feathers. Used mainly black and blue, purple or green and as he sent out the third line, we had a BFT on before he could put the rod in the holder. We continued to troll on the outside of the crown and had several double and triple hooks ups. 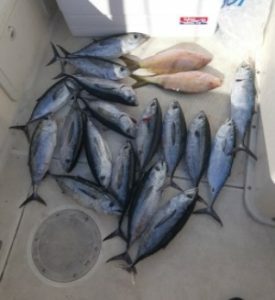 I think we could of have kept it up but we’d had enough of these smaller tuna and had plenty to eat. We tried the drift a couple of times with jigs and a livie but no success. With lots of BFT in the boat, we headed in to the reef to try and add some snapper. After checking out a couple new spots, we anchored on a piece that looked good on the sounder. Got set up and though there was barely a current, we put out chum anyway. It attracted a lot of fish but no yellowtail snapper. Kept chumming and finally in the distance we could see what looked like YT. After letting out a lot of line mine finally went tight and I pulled in my biggest YT. The next drop yielded another one almost as big. You can’t tell in the pic but the YT was as big as my last mutton snapper. While on the reef, I dropped a live one down to see who was home. Got rocked up the first time. On the second drop I was ready for the battle with the locked down. 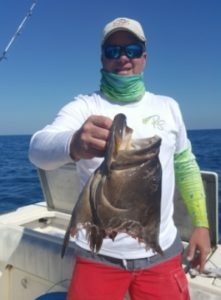 Got this grouper out of the rocks and it felt like I was winning until this happened. It was a fun day with a good guy and lot of fish in the box!